An analysis of ancient DNA recovered from sediments in the Arabian Sea suggests that climate changes that set in some 4000 years ago may have triggered the collapse of the early urban civilization in the Indus valley. The Early Bronze Age Indus civilization – also referred to as the Harappan culture after the site of one of its most important centers – was one of the world’s earliest urban societies, and can be compared with its contemporaries in Egypt’s Nile Valley and in the river valleys of Lower Mesopotamia. Centered on the floodplain of the Indus river, Harappan society evolved from agricultural and pastoral communities on the western flanks of the valley, and would eventually establish itself in throughout the catchment area in what is now Pakistan and northwestern India. The first cities emerged in the Indus basin around 2600 BCE. Seven centuries later, the population began to leave the major urban centers, triggering a decline in settlement that ultimately led to the disintegration and disappearance of this early urban society. The reasons for the exodus are still not entirely clear. A new study led by Dr. Liviu Giosan at Woods Hole Oceanographic Institution (USA) in cooperation with Professor William Orsi of the Department of Earth and Environmental Sciences at LMU and several other team members from the US, Australia and the UK, now suggests that climate change may have been a major factor in the decline and fall of the Indus civilization. The evidence presented by the team indicates that a marked strengthening of the winter monsoon took place around 1900 BCE which, together with associated changes in the region’s climate, could have contributed to emigration from Harappan cities. The findings appear in the journal Climate of the Past. 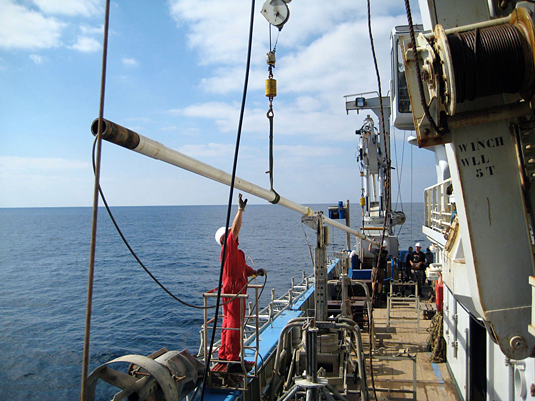 “We have used a new palaeobiological approach to reconstruct the history of the winter monsoon in the area around the Arabian Sea over the course of the last 6000 years,” Orsi explains. The researchers recovered and sequenced ancient DNA fragments conserved for thousands of years in the sediments on the sea-bottom. Based on an analysis of the nucleotide sequences of these DNA sequences, they were able to infer the overall composition of the plankton communities in the waters of the Arabian Sea, and track how it changed in time. They also determined the relative incidence in the sediments of elemental ratios within the shells of a specific unicellular organism that record past cold water temperatures. In this way, they were able to show that at the time when the cities in the Indus Valley were being abandoned, the make-up of the plankton communities in nearby marine water underwent a drastic change. In particular, the population densities of organisms that thrive under nutrient-rich conditions rose sharply, while the temperature proxy showed that the Arabian Sea became colder on average. “These results indicate that the intensity of the winter monsoon increased at this time. During the winter monsoon, the prevailing wind blows seawards, which leads to a fall in water temperature and transports deeper nutrient-rich water into the shallower sunlit depths of the ocean,” Orsi explains. According to the authors of the study, climatologists have detected an inverse correlation between sea-surface temperatures in the northern Arabian Sea and rainfall levels in the western foreland of the Himalayas. An intensification of the winter monsoon would then be expected to lead to higher levels of precipitation to the north of the Indus catchment area. In the lower reaches of the Indus valley, on the other hand, the climate most probably became drier, because the summer monsoon was correspondingly weakened and therefore brought less rain with it, as several studies imply. Orsi and his co-authors therefore assume that these developments could both have contributed to the fall of Harappan civilization. “We believe that they may have had a push-and-pull effect,” says Orsi. “The decline in the water supply of the Indus Valley was the push that forced people to leave the region. The increase in winter rainfall in the Himalayan foreland could well have been the pull that drew them away from the alluvial plain of the Indus”, adds Giosan.